Looking for flavorful baked beans without the bacon? Try our Reduced Sodium Vegetarian Baked Beans. We cut the sodium and kept the flavor, which features tender navy beans in a tangy sauce seasoned with brown sugar and a special blend of spices. This variety has 25% less sodium than our regular Vegetarian Baked Beans. 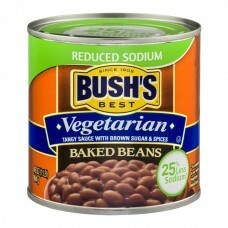 Bush's® Best Reduced Sodium Vegetarian Baked Beans. 25% Less Sodium* Since 1908. Tangy sauce with brown sugar & spices. *As compared to our regular vegetarian baked beans. Dear friends, Our company, which was founded in 1908 by my great-grandfather, A.J. Bush, is proud to bring you this quality product. Our baked beans are made from a secret family recipe that's been passed down and closely guarded by generations of the Bush family. Bush's baked beans are slow cooked, using only the finest ingredients and the greatest of care, so that you can taste our secret family recipe in every bean. To us, that's more than a slogan... it's a promise, to bring the flavor of our family's table to yours... every time. Enjoy. Secret family recipe. Please refer to code on end of can. Steel. Please recycle. Gluten free. This product contains 410 mg of sodium per serving versus 550 mg for our regular vegetarian baked beans. 1-800-590-3797. www.bushbeans.com. Heating directions: Microwave: Empty contents into microwave-safe container. Cover. Heat 1-2 minutes. Stir and serve. Conventional: Empty contents into saucepan. Heat to simmer.